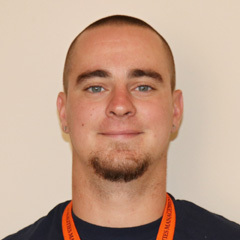 Cameron Sellers is a 19 year old first year electrical apprentice at UVA Facilities Management. 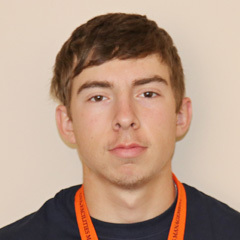 He is a recent graduate of Riverheads High School in Augusta County. During high school, Cameron played on the baseball team. He was part of their second-ever state title win! He also attended Valley Vocational School located in Fishersville, Virginia to get a head start on his future in the skilled trades. Tim Simonin is married and the proud father of two beautiful children. He has worked numerous positions to just get a paycheck, but never felt fulfilled. Tim had been working hard to improve his position for a few years. When the opportunity arose to apply for the UVA Facilities Management Apprenticeship Program, he jumped at the opportunity to better his career path. Recently, the Maxine Platzer Lynn Women’s Center at the University of Virginia received funding for the creation and installation of a mosaic to be put in their newly-renovated space. The "Stronger at the Broken Places" mosaic wall was designed by a current UVA student and the first portion of the mosaic will be installed over the course of several weeks this spring using volunteers from across the UVA community. Owing to the volunteer-driven nature of this project, as well as the technical skills and experience needed to measure and operate tile-cutting equipment, the Women’s Center staff reached out to UVA Facilities Management to see if FM employees would be available to help with cutting the tile to be used for the mosaic. The pre-cut tile will save a significant amount of time and will allow volunteers to begin immediate assembly of the mosaic. 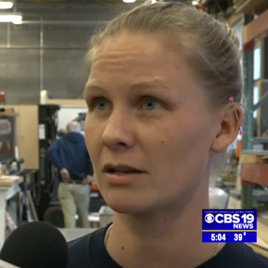 UVA FM Occupational Programs Director Laura Duckworth recognized this as an opportunity for the FM tradeswomen to jump in and help. Due to the intricate nature of the tile-cutting needed, this task was not suited for a large group of volunteers (unlike FM’s Empowering You Toolbox Workshops). Anne Lassere, a UVA FM Carpenter Apprentice, and Chelsea Short, a UVA FM Electrician, got to work on cutting the ceramic tile. Anne & Chelsea spent two days, totaling 12-14 hours, and were able to cut about 95 percent of the tiles that the Women’s Center needed done. 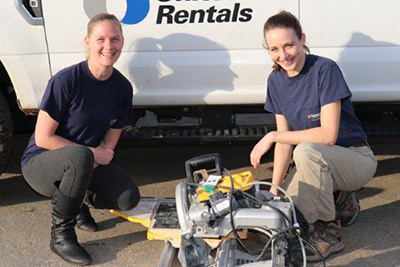 United Rentals generously donated the use of a tile saw for the two days of work at no cost. Their donation and their continued support of the community, as well as the Apprenticeship Program, is greatly appreciated. 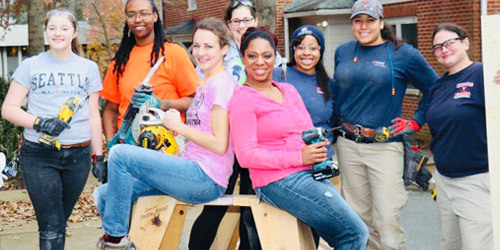 Find out more about FM tradeswomen and/or the UVA FM Apprenticeship Program by emailing fm-apprenticeship@virginia.edu. 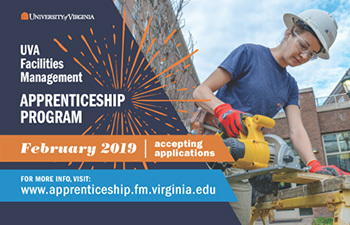 Established in 1982, UVA Facilities Management Apprenticeship Program offers highly motivated applicants an opportunity to learn a skilled trade through a combination of on-the-job training, technical education and classroom instruction in a four-year program. The University’s apprenticeship program was the first of its kind to be established by a state agency in Virginia and has been a model for other programs. In addition to the success and longevity of the program, Facilities Management is proud that the majority of graduated apprentices make a career at the University. 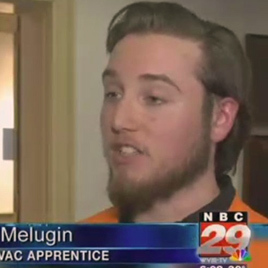 Each year, approximately seven to thirteen new apprentices are brought into the program depending on business needs. Some of the trades represented in our program include: plumbing, electrical, carpentry, masonry, plastering and HVAC. Each apprentice is a full-time University employee with salary and benefits. Apprentices train on the job with licensed journeymen, mentors, supervisors and others who help ensure the highest quality facilities management for the University and the Health System. Applicants must be able to meet the physical requirements for their prospective trades. They must be a high school graduate or hold a General Educational Development (GED) certificate and be at least 18 years of age by the time new apprentices begin work. Advertisement and recruitment for the apprenticeship program is conducted annually in February and March. Interviews are conducted in the spring, and new apprentices begin onboarding in July, with classroom instruction beginning shortly thereafter.